Receive the annual SPSS Stallion Guide by post ahead of it's general distribution. 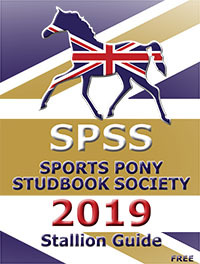 Advertise SPSS Passported/Registered ponies for free on the Sales page. Submit news, photographs and other information about their SPSS ponies. Note that only fully paid up members can passport, register and grade ponies with the SPSS for breeding and documentation purposes. The SPSS will mail each issue of The British Breeder magazine to members. There are normally 4 issues a year, in February, May, August and November. Membership runs per calendar year. Family membership covers 2 or more named people at the same address. Individual membership is for those aged 18 and over only; those under 18 can be family members but the first listed family member must be 18 or over. Note that the annual membership fees have increased for 2019. However, if you set up a Standing Order or regular Bank Transfer to pay for your membership on 1st January each year, then the cost remains at 2015 rates (ie £25 for individuals and £35 for families/ foreign).